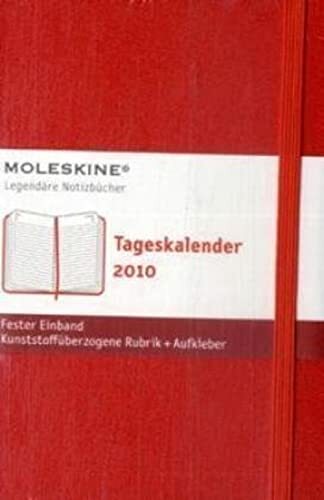 The Moleskine 2010 Pocket Daily Planner is dated from January 2010 to December 2010 and it has a very trendy red hard cover. Formatted to show each day on its own page, this popular planner is the essential piece of the new multimedia puzzle. In the inside pocket there is an insert with 24-page archive and 225 adhesive labels to mark important dates and deadlines. Every Moleskine product is thread bound and has a cardboard bound red cover with rounded corners, acid free paper, a bookmark, an elastic closure and an expandable inner pocket that contains the Moleskine history. "The Moleskine 2010" diaries are bound in cardboard, with a 'moleskine' cover with rounded corners and an elastic closure. Available in daily and weekly versions, each include a monthly planner on 12 pages. The paper is acid-free and thread bound, and the diary includes an expandable inner note holder made of cardboard and cloth, a ribbon placeholder and a removable card with the history of Moleskines. The 400-page daily diary has a new page for each day, with plenty of space for notes and appointments. It is the limited edition in red.